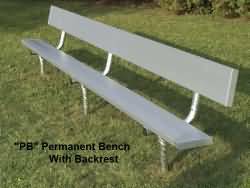 Our in ground aluminum bench sometimes referred to as a permanent bench is standard equipment at many outdoor parks and commercial settings thoughtout the USA. 6' L In Ground Bench With Back - Seats 4 Weight 95 lbs. 8' L In Ground Bench With Back - Seats 5 Weight 102 lbs. 12' L In Ground Bench With Back - Seats 8 Weight 140 lbs. 15' L In Ground Bench With Back - Seats 10 Weight 151 lbs. 21' L In Ground Bench With Back - Seats 14 Weight 221 lbs. 24' L In Ground Bench With Back - Seats 16 Weight 256 lbs.